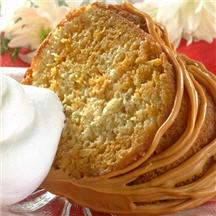 This banana cake has something extra special inside and out -- sweet butterscotch. Try it for dessert tonight or for your next party. Preheat oven to 375°F (190°C). Grease 10-cup Bundt® or round tube pan. Microwave 1 1/3 cups morsels in medium, microwave-safe bowl on MEDIUM-HIGH (70%) power for 1 minute; stir. Microwave at additional 10 to 20-second intervals, stirring until smooth. Combine cake mix, eggs, bananas, vegetable oil, water and granulated sugar in large mixer bowl. Beat on low speed until moistened. Beat on high speed for 2 minutes. Stir 2 cups batter into melted morsels. Alternately spoon batters into prepared Bundt® or round tube pan. Bake for 35 to 45 minutes or until wooden pick inserted in cake comes out clean. Cool in pan for 20 minutes; invert onto wire rack to cool completely. Place remaining morsels in small, heavy-duty plastic bag. Microwave on MEDIUM-HIGH (70%) power for 30 seconds; knead. Microwave at additional 10 to 20-second intervals, kneading until smooth. Cut tiny corner from bag; squeeze to drizzle over cake. Nutritional Information Per Serving (1/12 of recipe): Calories: 470 Calories from Fat: 210 Total Fat: 23 g Saturated Fat: 9 g Cholesterol: 70 mg Sodium: 340 mg Carbohydrates: 59 g Dietary Fiber: 1 g Sugars: 42 g Protein: 4 g.